The New England Revolution is only four games into the 2019 MLS season, and it is in trouble. 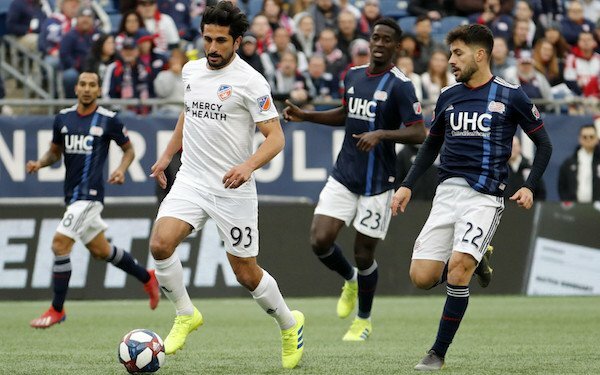 The Revs remained winless when they lost, 2-0, at home to expansion FC Cincinnati. Kekuta Manneh scored in the 44th minute, and Kenny Saief added a goal in the 65th minute for FC Cincinnati, which is now 2-1-1. Head coach Brad Friedel listed off the problems with the Revs, beginning with how they played in the first half. "You had one half that we probably had five or six players that lacked any kind of desire to work," he said. "You know, it’s as simple as that. When you’re playing a team that will hit the amount of long passes that they do, and only play for second balls, [Victor] Ulloa and [Leonardo] Bertone. I’m not trying to take away from their points at all and all they do is win the second ball and then break. You have to work through that. It doesn’t matter what team you are in the world. Take the biggest of the biggest names. You have to work to earn the right to get the ball. So, the first half, we did not work to earn that right to have the ball." Friedel won't say the Revs' problem was it didn't take FC Cincinnati seriously enough. "I think there’s a whole host of reasons when you’re sitting bottom of the Eastern Conference," he said. "There could be a lack of confidence. There could be nerves. There could be not [being] fit enough to do that kind of work. There could be not wanting to do the dirty side of the game, because it’s not every player in the world that likes to do that. Again, it’s the stuff that never gets printed." He wouldn't say the problems were due to a lack of spending, listing off what's been done recently. He said he didn't like having to talk about losing -- especially to FC Cincinnati, which was depleted by international call-ups. "That doesn’t make me happy," he said. "And I will be in here with my staff trying to figure out how we make it better. I mean, that’s what we do. I don’t stand up here and tell you guys stories that I don’t think are true. So, yes, mentality. Mentality of a player in this league, a lot of the players, when they lose, it doesn’t hurt enough. There’s no relegation. They don’t get fined. They don’t have fans waiting by their cars. They don’t have people beating them up. They don’t have all this. They don’t have the pressures that they have in other leagues. So, we have to, as a staff, put the pressure on them or we have to find the players that it doesn’t matter. Some people are self-motivated. Some people aren’t." 8 comments about "Friedel searches for ways to light spark after another Revs' defeat". Kenneth Osgood, March 25, 2019 at 8:59 a.m.
Reading this I have the same thought I had yesterday watching the game: Yes, there are some issues with the composition of the team, but Friedel has had them together since the middle of January, and yet they played, especially in the first half, like they didn't know or trust each other. Isn't he responsible for that? beautiful game replied, March 25, 2019 at 9:41 a.m.
Friedel is making excuses when he should be concentrating on being the commander of a sinking vessel. No solution means no change. frank schoon replied, March 25, 2019 at 10:14 a.m.
First all, regardless of all the problems created by New England due to managgement , I would never ,ever higher a former goalie as coach. Period!! Bob Ashpole replied, March 25, 2019 at 4:43 p.m.
Frank, I understand where you are coming from, but everyone has weaknesses. The key is to know your own limitations and compensate for them. His first assistant was a back too (Mike Lapper). The second assistant (Marcello Neveleff) doesn't list any playing experience on his bio. The other assistant is Ruben Garcia who lists 14 years of pro playing experience under a different name, but doesn't list his position. I don't know of him and cannot find any hits on google. Friedel has apparently picked associates that are like minded. Ginger Peeler, March 25, 2019 at 10:04 a.m. The “dirty side of the game”? What the heck is that? And he’s lamenting the lack of fanatic fans who will threaten the players? He failed to accept the blame for any of it. And this man is the coach? Oh, please!!! John Soares, March 25, 2019 at 1:53 p.m. Seems like he has the wrong approach top to bottom. Everybodies fault except me. Carla Nastri, March 25, 2019 at 2:29 p.m. Pointing the finger at the players for the teams problems is not leadership. He did not once take any responsibility for the results. Truth is he does not know what is wrong so he is lashing out. Fielding 3 different formations in four games is a good indication that he, as a coach, does not know how to use the players effectively. Watching him on the sidelnes berate the players during a game reminded me of the parent coaches I often see at youth games. No wonder the players are tentative and have poor touches. If he does that at a game, I would hate to see him during a practice. I am sure all the players are busy trying to figure out what he wants form them, which is a fruitless endevor since clearly, he does not know himself. No player will play well in such an environment. Bob Ashpole, March 25, 2019 at 4:26 p.m.
Blaming the players in the press is piling error on error.